Well…..I discovered something new in my crazy lab of wonders. Yes, I love to use hand embroidery for details, but sometimes those details would look well….not so good even in hand embroidery. It is a scale and texture thing. That is my scientific explanation anyway. So I had this problem. 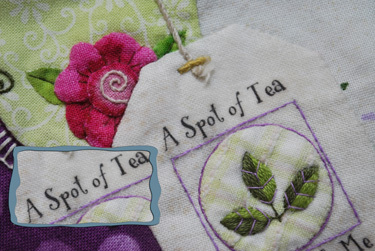 How can I get the really cool text from my printer onto a small appliqued label and make it permanent on the fabric of MY choice? I did not want to use those white/off white loosely woven prepared with some chemical or another fabric sheets that we buy retail for the cost of our first child. hmmmm….off to my lab for some experimentation. Eureka! Why not print off the text onto my chosen fabric ironed to those 8.5″ x 11″ sheets of C. Jenkins Freezer paper? 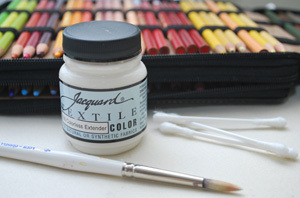 Then, like the colored pencils, use the Jacquard Textile Extender and gently paint over the printed text? Would it work??? 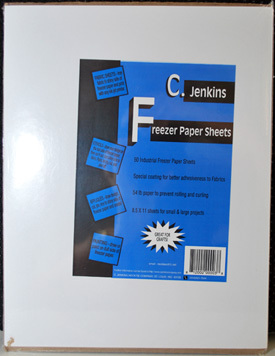 The C. Jenkins Freezer Paper is firm and already cut to 8.5 x 11, I buy it from Soft Expressions here. 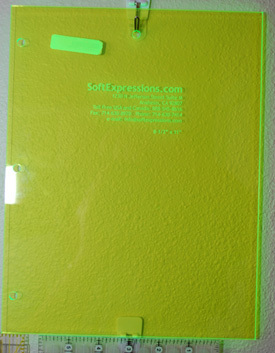 And then I use this ingenious 8.5″ x 11″ Pageboy Template from Soft Expressions for cutting my fabric to 8.5 x 11 and then iron it to the freezer paper and send it through the printer. That answer to my experiment would be YES!, Hallelujah!, it works! The text is soaked (although the pic doesn’t adequately reflect that) so you can see no movement of the ink. I am using an Epson Workforce 500 with the DuraBrite inks. My little no fancy stuff printer for my sewing room. No bleeding or anything and although I didn't want to majorly soak this project right now, trust me, it has been thoroughly soaked before and washed. Just make sure to heat set properly before wetting or washing! Make sure to heat set with a very hot iron for a ten count and then do not wet for a day or two. Then you should be good to go. The beauty of this is…. 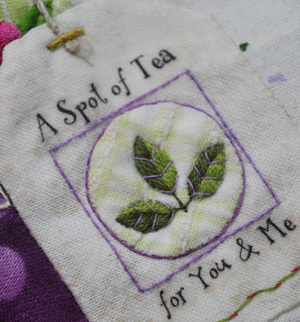 2) I can use any fabric I want for applique images or labels for the backs of my quilts. I now have another avenue of opportunity to take my quilt designs to new heights of detail. Hmmmm, what can I come up with next? sounds like a great discovery !! I have a ques , though . Doesn’t bubble jet set do the same thing ? Brilliant! Thank you for sharing your discovery–it’s excellent. Oh and Bubble Jet costs $$$$ too! I love it when I discover something that works and actually improves the process without any compromises. Color me happy. Those are great reasons !! I hope bubble jet isn’t getting hard to find though , I like to print out some pretty pictures on my labels. Some times I take a picure of one of the objects in my quilt and use thatin the label . I might go thru a lot of the textile extender doing that . Good Point Boop, that might be a bit much to have to hand paint the extender over photos. Not fun. I am always wanting to add nice looking text and smaller illustrations that would be a pain in my backside to embroider and it wouldn’t look good either so this was what I had in mind. Do you think it would work to iron the fabric to the 8-1/2 x 11 freezer paper, then trim by hand–not using the Pageboy Template? Is the Jacquard not a chemical ? Is it all right to cut the fabric smaller than the freezer sheet and then iron it on ? Does the fabric ever get caught in the printer ? I never have tried cutting the fabric smaller because of the roller grab mechanism that is not so gentle. I tend to make sure I give it an edge to grab that contains both layers so there is no spearation of the two. Did that make sense? If the fabric is not firmly attached to the freezer paper sheet, then you might have issues with separation as it feeds and jamming of the printer. Also make sure you keep the cut edges free of any fraying threads. Another question – I print labels on paper and then copy with Pigama pens, with the help of hand made light box. Would you recommend painting the pigma writing also with Jacquard ? Sara, because the pigma pen is already permanent you can skip this step of the textile extender application. It is not necessary. The extender is for printer ink that is not washable or immune from bleeding when in contact with anything wet.